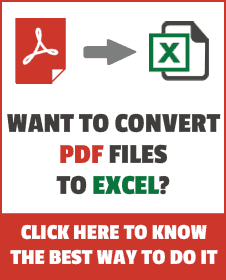 Want to insert the degree symbol in Excel? If you don’t know how to do this already, you may scratch your head and look for options. Unfortunately, it’s not as straightforward as you want it to be. There is no key on the keyboard to do this, or any direct option to do this using a click of a button. Don’t worry! There are plenty of ways to insert or type a degree symbol in Excel. In this tutorial, I will show you these easy ways to do it (including a keyboard shortcut). The method you choose would depend on how you are using the degree symbol in your work. Use the keyboard shortcut – ALT + 0176 (you need to hold the ALT key and then press 0176 from the numeric keypad of your keyboard). Once you have typed the degree symbol, you don’t even need to use the keyboard shortcut again and again. You can simply copy the already inserted degree symbol and paste it. You can copy and paste the degree symbol in Excel. To do this, you first need to copy it from a degree symbol already available in Excel, or you can copy it from any web page from the internet. 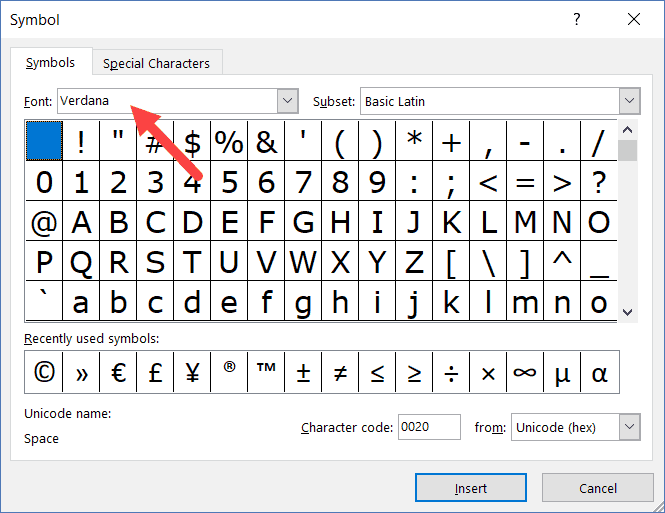 You can use the =CHAR(176) to get the degree symbol in a cell in Excel. To do this, enter =CHAR(176) in a cell and press enter and it will return the degree symbol as the result. You can also use this formula with other text strings or formulas to add the degree symbol to it. Similarly, you can combine it with a cell reference. For example, if cell A1 has the value 48, then you can use the formula =A1&CHAR(176), and it will give you 48° as the result. 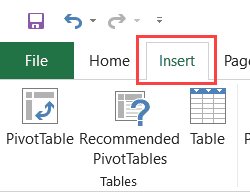 There is a ‘Symbol’ dialog box in Excel that allows you to insert symbols such as degree, cent, delta, etc. 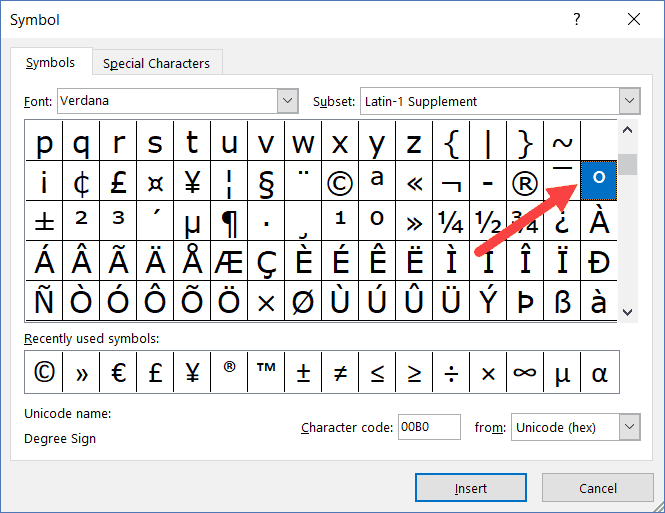 In the Symbols dialog box that opens, select the font in which you’re already working. Scroll down, find and select the degree symbol (you may have to spend some time looking for the degree symbol). This will insert the degree symbol in the cell in Excel. 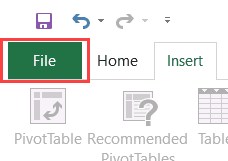 Now you can use this symbol as any other character in excel. You can copy it, refer to it, use it in formulas, etc. It enables you to assign a code to the degree symbol (such as DEGSYM). Now whenever you enter this text DEGSYM in a cell in excel, it will automatically convert it into the degree symbol. Note: I have chosen DEGSYM, but you can use anything else if you wish. In the Options dialog box, select Proofing. Now, whenever you type the text DEGSYM, it will automatically get converted into the degree symbol. This is case sensitive. So if you enter ‘degsym’, it will not get converted into the degree symbol. You need to enter DEGSYM. If you often need to add the degree symbol to numbers in a range, you can use a simple VBA code to do this quickly. This can be helpful when you get this data from a database or from other people and you have to add the degree symbol to all these numbers. MyCell.Value = MyCell.Value & "°"
The above code goes through all the cells in the selection and adds a degree symbol at the end of the number in the cell. You need to put this code in any module in the VB Editor. 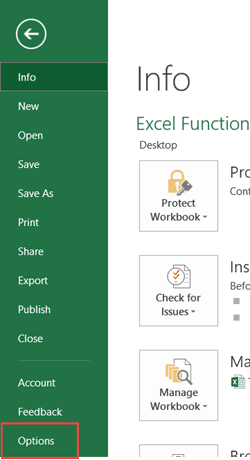 Once inserted, you can run the code from the VB Editor, add a button (as I did in the above example), or even add this to the Quick Access Toolbar. So these are the five methods (plus the bonus VBA method) you can use to type the degree symbol in Excel. Inserting Degree Symbol in Word.